We did it finally! Munrocount 282! Munros left 0! Compleation! A lot of exclamation marks! After 25 years of visiting Scotland we finally ticked our final 2 Munros Ruadh Stac Mor and A’Maigdhean in Fisherfield Forest. Not everything went as planned. If you want to know more about read Cord’s nicely written article below. For now this will be one of the last entries at this blog. It was fun while it lasted! “The best laid plans of mice and men often go awry” as the text from a poem by Robert Burns says. The intention to bag our final Munros in June 2017 had come to nothing when less than perfect tour planning and even less perfect weather conditions had seen us do only six successful hill walks during the nine days we spent in Alba. 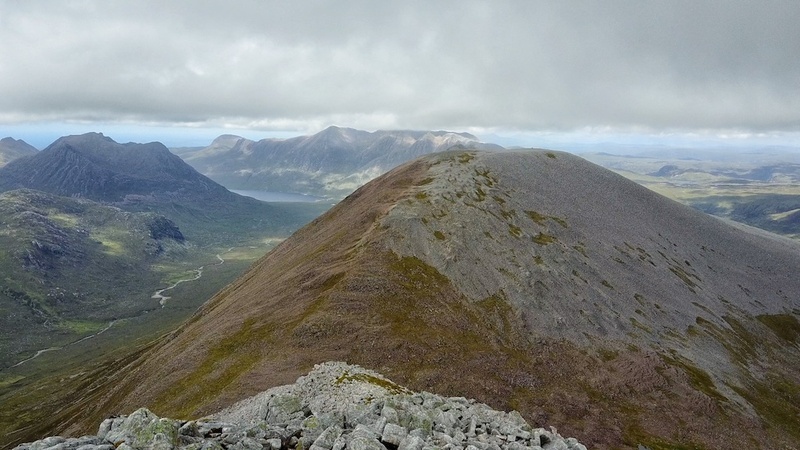 The sub-optimal use of our time left us with a total of 280 Munros bagged and A’Mhaighdean and Ruadh Stac Mor still unticked when we left Scotland in early June. After a few days back in Germany it became clear to us that we did not want to wait until 2018 for the compleation to take place. We checked our calendars and decided that the weekend of 9 and 10 September 2017 would see us back in Scotland to return to the Fisherfield Forest. So when we landed at EDI on Friday 8 September we were looking forward to our compleation weekend. Off we went in our cosy little Audi A1 towards the Northwest Highlands. We stacked up on provisions for the weekend and on gas for our stove in Aviemore. At around 5:45 p.m. we reached Corrie Hallie, slipped into hiking clothes and shouldered our really heavy rucksacks. At 6:10 p.m. we left the parking and embarked on the hike towards Shenavall Bothy some eight kilometres away in Strath na Sealga. After failed compleating in June we didn’t wailed for long but put ourself together and planned our next trip to Scotland. So we are going again in September, fly in to Edinburgh, drive to Corrie Hallie, walk in to Shenavall, built up our tents, will have a nice outdoor meal and of course a wee dram or two, sleep well, get up early in the morning AND will hopefully finally bag Ruadh Stac Mòr and A’Mhaighdean. Then we will walk out and drive to Ullapool and will have a compleater curry and hopefully lots of beers. 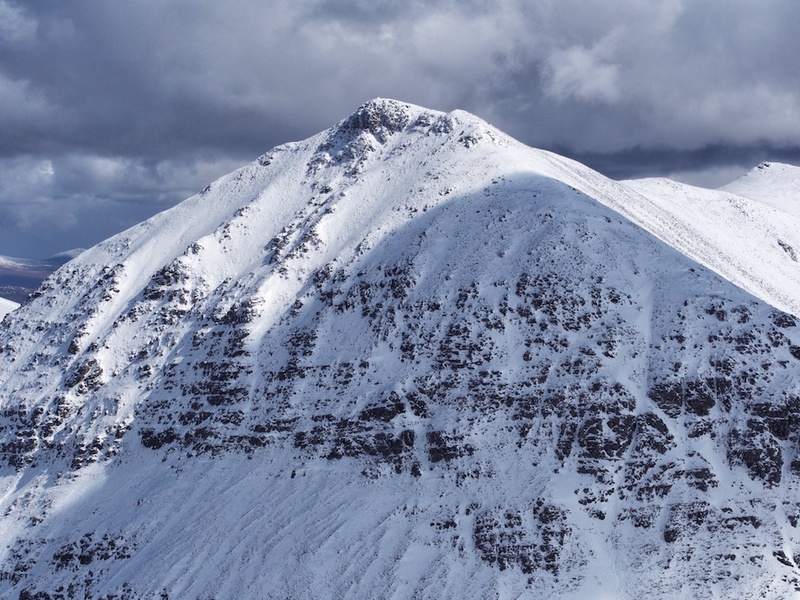 And while we are in that marvellous area there should be a return to An Teallach, one of our first Munros. Definitely looking forward to that microadventure. It is as it is. We missed our compleating goal. 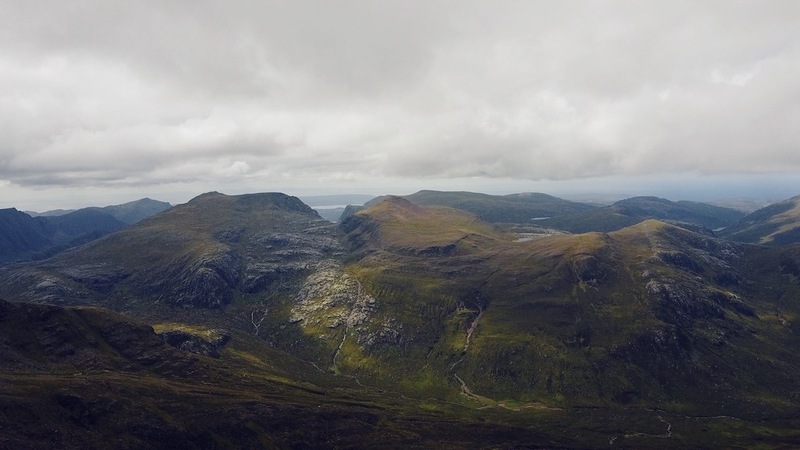 280 in the sack, 2 Munros left: A’Mhaighdean and Ruadh Stac Mor in Fisherfield Forest. We blame organizational faults and of course the weather. So another last trip is what we need to compleate. Nothing planned yet but we will for sure come again. 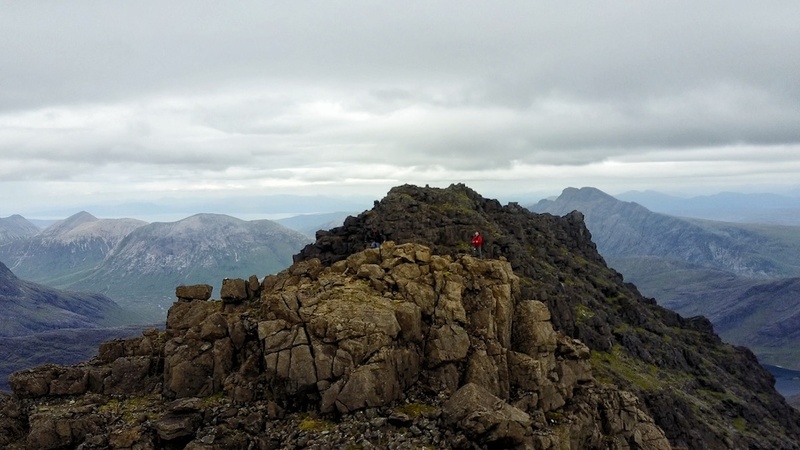 In 2007 Frank and I had been acting under the delusion of being able to summit the Inaccessible Pinnacle on our own when we had first visited the Sgurr Dearg summit area. But we soon had realized that climbing the Pinnacle without professional help would be foolhardy to say the least. So on 7 June 2017 we met our friendly guide Ian at the Glen Brittle Memorial Hut (why is it called ‘Memorial’ Hut?). Ian handed us our climbing gear (harness and helmet) and soon we were on our way on the path that leads up towards the Eas Mor and the west ridge of Sgurr Dearg. After a short test of our stamina and fitness on behalf of Ian, who stormed up the path like a torpedo, we settled into a more leisurely speed suited to our limited energies and lower lung capacities. Anyhow, we made good progress on the excellent path and soon left the grass behind. The lower part of the ridge between Coire na Banachdich and Coire Laggan is quite steep and in the middle of the ascent a chimney of sorts catered for some very mild scrambling in order to avoid an alternative path in the unpleasantly steep scree slope. Soon we topped out on a slightly flatter section of the ridge and continued on the obvious path towards Sgurr Dearg. Ian pointed out the highest source of fresh water in the Cuillins, a little spring where cold water was merrily dripping from one of the rocks. Delicious. The views into the corries below and out towards the sea were stupendous! Only the summits hid in the clouds on this otherwise sunny day. June 2017 was a rather wet month in the Northwest Highlands. Frank and I had experienced what it means to be scrambling in the Skye Cuillins in bad weather in 2007 when we climbed five Skye Munros in clag, got drenched to the bones on more than one occasion and turned back a few dozen metres below the summit of Sgurr Dubh Mor because the rocks were wet and slippery on the more exposed parts of the scramble. 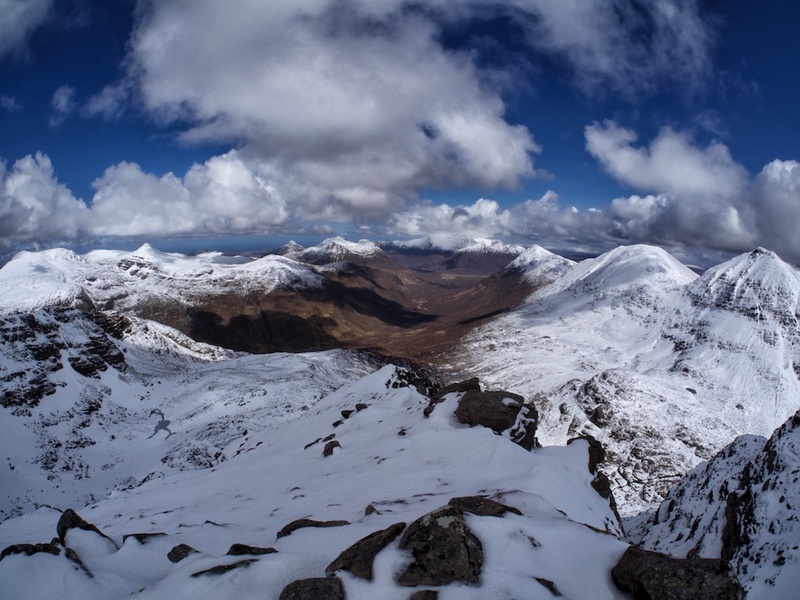 So this time we patiently waited for a weather forecast predicting acceptable conditions in the Cuillins. Thursday 8 June 2017 was such a day. At about nine o’clock we parked our car at the end of the public road in Glen Brittle and set off towards Coire a’Ghrunnda. The going on the broad path was easy until we rounded Sron na Ciche and the steep rocky climb into Coire a’Ghrunnda proper started. 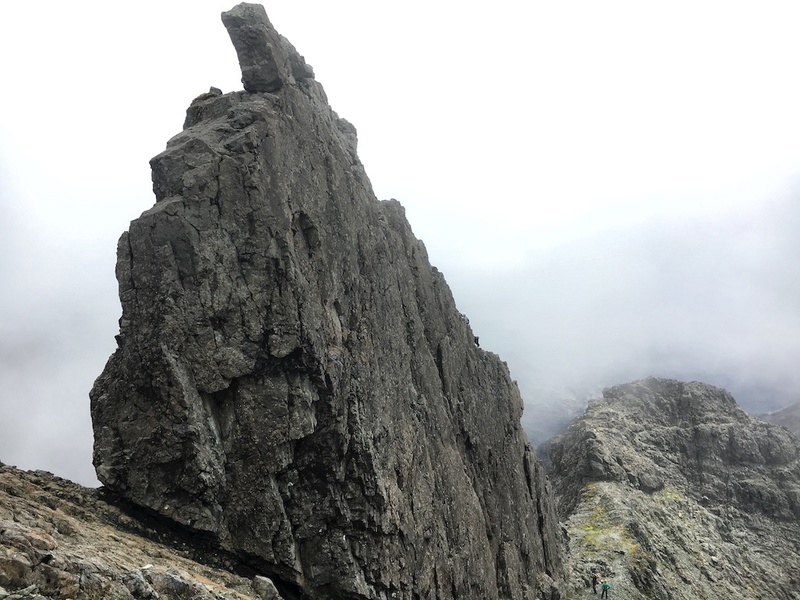 Once the first steep section was completed at about 400m the lip of the upper corrie girt by large rocks, boulder fields and the outflow of the loch cascading down over a succession of slabs came into view about 250m above our present position. We continued the climb up the steep path on the very left-hand side of the corrie through scree and over boulders in the passing company of three or four other groups of hikers. Some minor scrambling was called for before we reached the Loch Coire a’Ghrunnda at about 700m. This is a real gem of a corrie! We sat close by the shoreline of the loch and marvelled at the scenery trying to name the hills which encircle the loch. A repeat. At least most of the tour was a repeat of what we did two years ago when we climbed Beinn Tarsuinn. You see, the approach to these three Munros is definitely the longest bit of the tour and the really hilly part of the tour is not that long. Then, on the last day in April 2015, conditions had been quite wintry with slushy, powdery, compacted or icy snow underfoot depending on the aspect of the hill and the altitude you were at. That day we had not been able to add Mullach Coire Mhic Fhearchair and Sgurr Ban to our tick list. On 7 June 2017 the conditions were different since there was no snow left anymore this late in spring. But again like 25 months ago we left our bicycles at the Heights of Kinlochewe. Again we climbed the Landover track beside the Abhainn Gleann na Muice and gained the open moor. Just as in 2015 the hike to Lochan Fhada offered great views of Slioch’s north-west aspects, of Beinn Tarsuinn, Meall Garbh and Mullach Coire Mhic Fhearchair. At least when the hills peeped out from the rain clouds. But the ground was reasonably dry, even though there had been rain and some showers very recently, when we picked up the faint track leading through grass and over some slabby sections all the way from the shore of beautiful Lochan Fhada to the Bealach Odhar. We reached the bealach and sat down in the lee of some rocks to enjoy the views of A’Mhaighdean and Ruadh Stac Mòr in the sunshine. Then without further ado we continued along the bypass path below Meall Garbh and reached the foot of the steep south ridge of Mullach Coire Mhic Fhearchair.